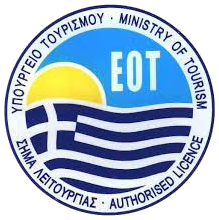 Explore with Cretan Tour Experts Travel Agency and its qualified team, the beautiful byzantine monasteries of Crete, with the renowned the frescoes and icons. An opportunity to enjoy the spiritual and timeless art, see the love and grace of man for God and salvation of his soul Crete – one of the earliest churches established by St. Paul in European soil. Send us an email and we will plan the ideal tours for you to include as many of the monasteries listed below in combination with the Minoan highlights or the beautiful traditional villages of the island. The island of Crete came under the rule of the Byzantine Empire in two periods: the first extends from the late Roman period (3rd century) to the conquest of the island by Andalusian exiles in the late 820s, and the second from the island’s recon quest in 961 to its capture by the competing forces of Genoa and Venice in 1205. Under Roman rule, Crete had formed a joint province with Cyrenaica, that of Creta ET Cyrenaica. Under Diocletian (r. 284–305) it was formed as a separate province, while Constantine the Great (r. 306–337) subordinated it to the Diocese of Moesia (and later the Diocese of Macedonia) within the praetorian prefecture of Illyricum, an arrangement that persisted until the end of Late Antiquity. Some administrative institutions, like the venerable Koinon of the island, persisted until the end of the 4th century, but as elsewhere in the empire these provincial civic institutions were abandoned in face of the increasing power of imperial officials. Few contemporary sources mention Crete during the period from the 4th century to the Muslim conquest in the 820s. During this time, the island was very much a quiet provincial backwater in the periphery of the Greco-Roman world. Its bishops are even absent from the First Council of Nicaea in 325, in contrast to neighboring islands like Rhodes or Kos. With the exception of an attack by the Vandals in 457 and the great earthquakes of 9 July 365, 415 448 and 531, which destroyed many towns, the island remained peaceful and prosperous, as testified by the numerous, large and well-built monuments from the period surviving on the island. In the 6th-century Synecdemus, Crete is marked as being governed by a consularis, with capital at Gortyn, and as many as 22 cities. The population in this period is estimated as high as 250,000, and was almost exclusively Christian, except for some Jews living in the main urban centres. This peace was broken in the 7th century. Crete suffered a first raid by the Slavs in 623, followed by Arab raids in 654 and the 670s, during the first wave of the Muslim conquests, and again during the first decades of the 8th century, especially under Caliph Walid I (r. 705–715). Thereafter the island remained relatively safe, under the rule of an archon appointed by Constantinople. In ca. 732, the emperor Leo III the Isaurian transferred the island from the jurisdiction of the Pope to that of the Patriarchate of Constantinople. A strategos of Crete is attested in 767, and a seal of a tourmarches of Crete is known. This has led to suggestions that the island was constituted as a theme in the 8th century, perhaps as early as the 730s. Most scholars however do not consider the evidence conclusive enough and think it unlikely that the island was a theme at the time. Byzantine rule lasted until the late 820s, when a large group of exiles from Muslim Spain landed on the island and began its conquest. The Byzantines launched repeated expeditions to drive them back, and seem to have appointed a strategos to administer what parts of the island they still controlled. The successive campaigns were defeated however, and failed to prevent the establishment of the Saracen stronghold of Chandax on the northern coast, which became the capital of the new Emirate of Crete. The fall of Crete to the Arabs posed a major headache for Byzantium, as it opened the coasts and islands of the Aegean Sea to piracy. A major Byzantine campaign in 842/843 under Theoktistos made some headway, and apparently allowed for the re-establishment of the recovered parts of the island as a theme, as evidenced by the presence of a strategos of Crete in the contemporary Taktikon Uspensky. However Theoktistos had to abandon the campaign, and the troops left behind were quickly defeated by the Saracens. Further Byzantine attempts at reconquest in 911 and 949 failed disastrously, until in 960–961 the general Nikephoros Phokas, at the head of a huge army, landed on the island and stormed Chandax, restoring Crete to Byzantium. After recon quest, the island was organized as a regular theme, with a strategos based at Chandax. Extensive efforts at conversion of the populace were undertaken, led by John Xenos and Nikon “the Metanoeite”. A regiment (taxiarchia) of 1,000 men was raised as the island’s garrison, under a separate taxiarches and subdivided into tourmai. Under Alexios I Komnenos (r. 1081–1118), the island was ruled by a doux or katepano. By the early 12th century, it came, along with southern Greece (the themes of Hellas and the Peloponnese) under the overall control of the megas doux, the commander-in-chief of the Byzantine navy. Aside from the revolt of its governor, Karykes, in 1092/1093, the island remained a relatively peaceful backwater, securely in Byzantine hands until the Fourth Crusade. During the Crusade, Crete appears to have been granted to Boniface of Montferrat as a pronoia by the emperor Alexios IV Angelos. Boniface however, unable to extend his control to the island, sold his rights to the island to the Republic of Venice. In the event, the island was seized by the Venetians’ rivals, Genoa, and it took Venice until 1212 to secure her control over the island and establish it as a Venetian colony. This beautiful and majestic cathedral is located on a square east of Halidon Street in the Old Town of Chania, and is built around the 13th century. It has three sections that are dedicated successively to the Virgin, Saint Nicholas and the Three Hierarchs. The Convent of Chrysopigi, just outside Chania, is dedicated to Mother Mary, the Life-Giving Font (Panagia Zoodochos Pigi). The monastery is located in a small alley right of the central road connecting Chania to Souda, three kilometers southeast of the city. The convent is built like a fortress and it was founded as a monastery by Ioannis Chartophylakas, at the end of the 16th century. During Venetian rule it was a significant spiritual center with a well-stocked library. It’s stopped flourishing with the Ottoman siege in the summer of 1645, when Philotheos Skoufos, the Father Superior, escaped to the Ionian Islands, taking with him the holy heirlooms of the monastery. Since then the place was deserted until it was restored in the 18th century. During the Liberation Revolution against the Ottomans it was burnt down. After 1830 it played an important ecclesiastical role, but during the Second World War the Nazis obliged the monks to leave and caused serious damage to the buildings. In 1976 Chrysopigi was restored and became a convent. In the interior of the church, which is dedicated to the Life-giving Font (Zoodochos Pigi), there are wonderful icons of the 19th century and a wonderfully carved wooden iconostasis. On display at the ecclesiastical museum there are on display icons from the 15th, 16th and 17th centuries along with holy utensils and old hand-written books. Within the convent premises there is also a small folk museum. The Monastery of Agia Triada is located 15.5 km northwest of Chania, near the village of Kumara, in Akrotiri area, surrounded by a landscape of incredible natural beauty. The main church of the monastery has been built in a cross shape, and has a round dome and two side chapels which are dedicated to Zoodochos Pigi and to Saint John the Theologian. The part that will mostly impress you is its facade, which is a true miracle. It is built of pink coral stones and has two large Doric columns and one small Corinthian, forming the entrance. A wonderful belfry with three bells stands on top of the facade. The monastery was very important during the revolution against the Ottomans. When the church was destroyed by the occupiers, the monks rebuilt it. In 1833 when the monastery housed an enclosed school that remained there for some time. You can visit its beautiful library which is like a small museum. You will see old vestments and rare books as well as wonderful pictures of the famous religious painter, Mercurius of Santorini. This beautiful whitewashed monastery was built on a rock at the point of an old monastic community on the west coast of Crete, 72 km west of Chania. The view from there is truly stunning. The main church has two temples, which are dedicated to the Virgin Mary and the Holy Trinity. You can combine your visit there with a swim at the amazing Elafonisi beach, only 6 km. from the Monastery. In the province of Kissamos in western Crete, on the way to Elafonisi, shortly after the village Topolia, you pass through a small tunnel. Just at the exit of the tunnel, up, at right, you will see the opening of a cave and an unusual metal star shining in the rays of the sun. It is the entrance to the cave of Agia Sophia. You go up several stairs, and then follow a small path. While approaching, you realize that the opening is large enough and you will see the roof of a small church on the left. It is the church of St. Sophia, located in the cave. It is a small, ordinary church without special architecture or paintings. But what makes it unique is its surrounding, with the large stalactites and stalagmites. The Guverneto Monastery is situated at the northeast end of Akrotiri, on a location full of lentisks, thyme, wild olive trees and carob trees. It is one of the oldest monasteries of Akrotiri. Guverneto was founded after the 11th century and destroyed by fire before 1765. The bloodiest pages of its history were written during the Liberation Revolution of 1821, when the Ottomans massacred the monks and looted the monastery. The fortress wall is rectangular and there are four square towers, one on each corner. Cells are built all around and in the centre of the yard there is the cupola-covered church, with beautiful Venetian sculptures and two small chapels. The church is dedicated to the Presentation of Mother Mary (Eisodia tis Theotokou) and this is also called the ‘Lady of the Angels’ (Kyria ton Angelon). The historic Preveli Monastery is located in the municipality of the southern coast of Rethymno and consists of building complexes separated each of 3 km. They stand near a bridge crossing the river Kourtaliotiko and is surrounded by lush vegetation. The monastery is divided in Lower and Upper. Inside the monastery visitors can admire the gold cross that has pieces of the True Cross and is considered miraculous by the faithful. During the German occupation offered shelter to many Greek fighters and foreign soldiers who took part in the Battle of Crete. The view from the monastery is unique as it is at a very great height and overlooks the endless Libyan. Do not forget to visit the amazing Preveli beach, only 5 minutes from the Monastery. The Arkadi monastery is located 23 km from the town of Rethymno, on the southern coast of Crete, nearby the idyllic Preveli beach. It is the most famous and important monastery of the entire region Rethymno Crete. The main church is a temple standing in the middle of the yard. It has magnificent facade symbolizing a perfect example of Cretan Renaissance architecture. It has a great reputation because of the historic event that took place in 1866 when the Turks sent thousands of soldiers to the island. When the Cretans heard of the arrival of the conquerors, hundreds of men, women and children took refuge in the monastery. However, this did not prevent the Turks to attack the monastery. To avoid the invaders and refusing to surrender, the Cretans set fire to a warehouse with gunpowder, which was blown up killing Greeks and Turks. From that day Arkadi became a token of the struggle against Turks and a proof of Cretan’s patriotism. The Church of Panagia ton Myriokefalon in the village of Myriokefala served as the catholicon of the Monastery of Panagia Antifonitria, dating back to the 11th century, which has not survived. The Monastery was built by Ossios Ioannis Xenos and remained in operation until the early 20thcentury. Apart from the catholicon, the remaining buildings date back to the 18th and 19th century. The catholicon belongs to the architectural style of free cross with dome. There are two layers of murals in the church, one dating back to the 11th and the other to the 13th century. The icon of the Virgin Mary in the church is considered miraculous. An old men’s monastery, located 12km east of Rethymno, in the Pangalochori community, possibly founded during the 2nd Byzantine period (961-1204). It was founded by a monk named Arsenios, after whom it was named. According to the most likely version of events, it was deserted at one point due to pirates causing problems to coastal hamlets and, like many other Cretan monasteries, it was renovated before 1600. The Church of Agios Georgios, the Catholicon of the Monastery, a cruciform domed basilica, was inaugurated during the late 16th century. The great earthquake of 1856 destroyed a large part of the monastery and a decade later, the monks donated its property for the war of liberation of 1866. During the final Cretan revolution (1897-1898), Arsani suffered its own holocaust, with the Abbot Gabriel Klados meeting his doom after conflict with the Ottomans. This was the final contribution of the monastery shortly before the liberation of Crete. The next landmark in the history of the monastery came in 1941, when the Germans executed monk Damianos Kallergis for fostering guerillas. The monastery was renovated in the early 1970s, with the addition of murals to the church and the construction of the museum and conference center. The Attali or Bali Monastery is located in the hills of Holy Obedience near Bali and is dedicated to Saint John the Baptist, dated in the 14th century. Because of the terrain, the monastery is built on levels and had stables, mill, bakery, fountain, pottery workshop and impressive wall paintings. The church is not in the center of the monastery as usual, but on the northeast side of the complex and outside the fortress which protected it from pirates.During the Ottoman rule the monastery suffered extensive damage, but managed to work again until 1980 when its maintenance started. In 1982 it was reopened. Diskouriou Monastery is located near the traditional hamlet of Axos and served as a glebe of Halepa Monastery. It must have been in operation during the late years of Venetian Rule, as it is listed in 1630 in the list of Mylopotamos villages. The fact that an important religious centre was located here is also proven by the fact that a very old Byzantine Chapel dedicated to Saint John is situated next to the Monastery.This is a monastery of citadel-style architecture, with the catholicon dedicated to Saint George situated at the middle of the structure. Although the Monastery has its roots in the era of Venetian rule, after successive destructions, it underwent extensive interventions during the 20th century and, as a result, the few elements that highlight its original farm have been preserved. During the revolution of 1821, the Monastery was set on fire and destroyed, while the earthquake of 1856 caused extensive damage. The Monastery played a significant role during the revolutions of 1866-1869 and, as a result, was set on fire by the Ottomans. Halepa Monastery was founded at the end of the era of Venetian rule and, according to documents dating back to 1555, it owned a significant amount of property. Inside the Monastery, there is a fountain, a stable, as well as workshops.The founder, according to an inscription at the Monastery, was Ieremias Sgouros in 1637. The monastery was destroyed during the Ottoman era but was subsequently reconstructed. Its catholicon is situated in the middle of the courtyard, but unfortunately only ruins remain. This is a two-aisled domed basilica dedicated to the Birth of Jesus and the Transfiguration of the Saviour. In the 19th century, Abbot Ploumis wanted to build a larger church around the catholicon, but this work was never completed. The Church of Agia Marina is located just outside the Monastery. The Cathedral of St. Minas:The small church of St. Minas did not meet the religious needs of the constantly growing Christian community, so the demand arose for the erection of a new cathedral. The plot for the new church used to be a garden that belonged to a Turk from whom it was bought. The architect was Athanasios Moussis and in 1862 the foundation stone of one of the most magnificent and impressive Greek churches was laid. The outbreak of the Cretan revolution of 1866 demanded the stopping of the building work which will continue in 1883 in order to be completed in 1895, when the inauguration of the exquisite temple took place. The church is of the cruciform type with a dome based on a high spandrel, while internally there are also elements of a three aisle basilica. It has two bell towers, one in the northeaster corner and the other in the southeaster one. The right aisle is dedicated to Apostle Titos and the left one to St. Ten Martyrs of Crete. The inside of the church has gone through many changes with new additions. With plans of the architect Anastasios Orlandos the woodcut icon screen was replaced by another one made of marble, the same happened with the bishop’s seat. The religious painting of the church was assigned to St. Kartakis who followed faithfully the principles and the models of the Byzantine icon painting. The hundredth anniversary from the inauguration of the Cathedral Church of St. Minas (1995) was celebrated with every solemnity that is suited in an equal occasion and more specifically to one of the most glorious and imposing Greek churches. One of the first and quite important works of the Venetian settlers was the building of a temple dedicated to their patron, St. Mark, in the center of the city and opposite to the Palace of the Duke. The church of St. Marc was not totally dependent on the Latin archbishopric, but on every duke of the Cretan Realm. Because he himself was not in a position to fulfil his religious duties, he appointed someone else, the “primikirio”or the “capellano” for that seat. Within the church all the lords and the state officials used to assume their duties with every formality while common people used to seek protection from their patron Saint. Also the church was used as a burial place for the dukes and members of the high class (they were put in special sarcophagi). Next to the church on the southwest corner there was a high bell tower with a clock. During the long Turkish siege of the city, the bell was used as a bomb alarm, which is why many times the bell tower became target of the Turkish cannons. When the Turks took over the city – Kastro -, the church of St. Mark was given to Defterdar Ahmet Passa who converted it into a mosque, named after him. The bell tower was demolished and in its place they built a minaret. The new conquerors, without having any respect for the sacred place, destroyed the frescoes and the Christian graves. After the exchange of population and the Turkish withdrawal, St. Marc came to the jurisdiction of the National Bank and then of the Municipality. Lastly, in 1956 a contract was signed between the Municipality and the E.K.I.M (Society of Cretan Historical Studies) in order to start the restoration of the building, so today it is an ornament for the city that is used as Municipal Art Gallery. Venetian archives contain several documents referring to the Vrontisi monastery. The earliest written reference dates back to 1474. However, it is older than that but the exact year of its establishment is unknown. Vrontisi was established as a metochion of the nearby Varsamonerou Monastery. The former fell into decline after 1500 whereas Vrontisi began to flourish and reached its apogee as a regional monastic and spiritual centre during the 16th and 17th centuries. 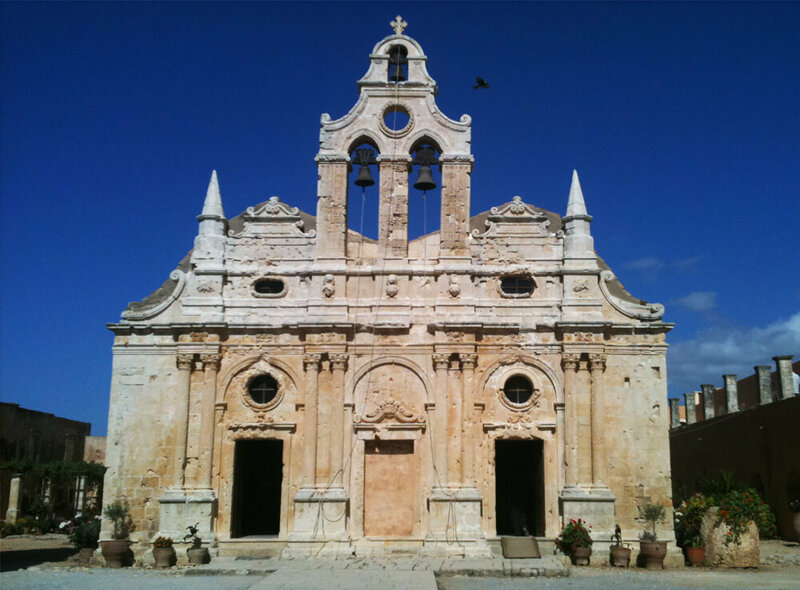 After the fall of Crete to the Turks, Arkadi Monastery was deserted and its monks fled to Vrontisi. According to tradition, Michael Damaskinos, the renowned painter of the Cretan School, is believed to have served as a monk at Vrontisi. Six of Damaskinos’ best known icons were kept at the monastery until 1800 and are nowadays displayed at the St. Catherine of Sinai museum in Heraklion. Owing to its fortified position, Vrontisi was used as a revolutionary centre during the Cretan uprisings of the 19th century. During the great Cretan revolt of 1866, Michael Korakas used Vrontisi as his headquarters. In reprisal, the Ottomans slaughtered the monks and burned all crops, which resulted in the monastery being deserted and most of its heirlooms destroyed. During the German occupation of 1941–44, Vrontisi provided shelter to resistance fighters. The fountain at the entrance of the monastery. Similarly to most monasteries built during the Venetian period, the monastery used to be heavily fortified and surrounded by thick walls. However, only parts of the west wall remain today. In the middle of the court stands a two-nave church (catholicon) dedicated to St. Anthony (Antonios) and St. Thomas. The church was painted with frescoes of which very few remain in the southern nave. An arched bell tower of Italian influence rises besides the church. At the main entrance of the monastery there is a marble fountain dating to the Venetian era, featuring Adam, Eve and four faces from which the water flows that symbolize the four rivers of the Garden of Eden. Due to this fountain, Ottoman Turks used to call Vrontisi Santrivanli Monastir, i.e. Fountain Monastery. According to the Italian architect Giuseppe Gerola (it), the fountain dates from the 15th century and was created by an artisan that could skillfully use the chisel, something that was uncommon in Crete at the time. 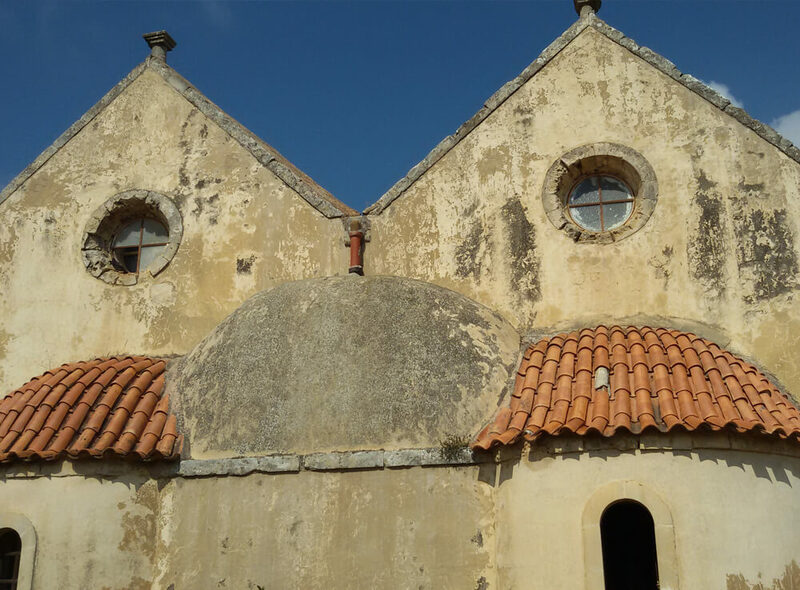 This is one of the oldest convents on Crete, situated south of Venerato village and built on top of the ruins of an ancient temple, as confirmed by the capitals located in the courtyard of the convent. The convent is dedicated to the Dormition of Mother Mary and has been in operation since the first centuries of the Byzantine Empire, reaching its prime during the Venetian era. During the era of Ottoman rule, the convent was a victim of unprecedented savagery by the Ottomans, as it was set on fire and only three of the 70 nuns survived. The convent was renovated in the late 19th century and a new period of flourishing followed. One of the most important elements of Paliani Convent is the Agia Myrtia, a centuries-old myrtle situated south of the Catholicon, which is celebrated on September 23, as the icon of the Virgin Mary was found at its trunk, according to tradition. This is certainly another case of survival of the ancient worship of trees, which flourished on Crete during the Minoan era. The convent church is a three-aisled basilica and is one of the oldest on Crete. Around the church, there are ruins of older churches from the first and second Byzantine era. Marble sections, columns, capitals, granite designs and inscriptions survive. The aisles of the church are separated by marble columns and capitals decorated with Byzantine depictions. The Holy Monastery of Saint George Gorgolainis, one of the most historic monasteries on Crete, was founded by Archpriest Sylvester in the 13th century, while the single-space arch-covered church dedicated to Saint George was erected in 1627. During the 20th century, an aisle was added to the catholicon, which is dedicated to Saint Nicholas. Also worthy of note is the Venetian fountain which was decorated with a marble lion until 1990, when it was stolen. During the era of Ottoman rule, the monastery was set on fire and it was renovated in 1957 by Archbishop Eugenios. The cypress tree and plane tree located at the Monastery have been declared landmark natural monuments. At the southern entrance of the homonymous gorge is located the Saint Agios Nikolaos Monastery, which was the third major monastery of the region of Zaros. Today, is maintained only the small temple of Saint Nikolaos which is going back to the 14th century. Also, are survived several parts of wall-paintings from that period and seems to have been a nunnery which was abandoned after some possibly destruction. In recent years the monastery is expanded with new buildings to meet the needs of the brotherhood of the Julian calendar which has installed in the monastery. On the eastern side of the gorge, 500 meters distance above the monastery of St. Nikolaos, is located a small cave hermitage of Saint Euthymius who came from the neighboring village Nivrytos to which it belongs the surrounding area. The tradition says that the nuns of the Monastery of St. Nikolaos killed accidentally the ascetic Efthimios when once, they perceived him within the gardens of the monastery, dressed with animal hides. East of the river and outside the precincts of the monastery of St. Nikolaos, is located the small chapel of Saint Minas. Probably in the entrance area of the gorge had flourished monastic state just like in many other gorges of Crete, in which is observed concentration of religious and monastic sites. According to the tradition in the St. Nikolaos, in antiquity, was existed the Temple of Poseidon, in place which was created the Christian church of Saint Nikolaos. Agios Nikolaos is somehow a replacement for Poseidon in Christian religious tradition. Perhaps, it is not coincidence its reference in many Venetian maps Templio De Saro (ie. the Temple of Zaros) and be associated with the nearby ancient sources of Sterna and Votomos in where may be worshiped the Poseidon. This is one of the largest and richest monasteries on Crete. It flourished during the era of Ottoman rule and is dedicated to Saint George. The structure of the monastery is reminiscent of 17th century secular Cretan architecture with independent cells, one built next to each other. The Refectory and the priory are located west of the church. The surviving manuscripts, dating back to the 18th century onwards, prove that this was the greatest period of flourishing for the monastery, during which it was one of the premier intellectual centres of the island. During the revolution of 1821, 18 monks were killed and the monastery was abandoned, before being reconstructed during the era of Egyptian rule. Visitors to the small museum of religious art can see icons, holy relics and manuscripts from the 18thcentury containing both texts and exceptional illustrations. The great number of monks at the Monastery confirms the great monastic tradition of Crete. The impressive and fortified monastery of Toplou is located 16 kilometers northeast of Sitia and dates back to the 15th century. The monastery is famous for its wonderful icon of the 15th century, painted by John Cornaro, depicting 61 scenes from the Orthodox liturgy. The monastery of Toplou is also famous for its history, as it accepted various attacks by conquerors. That’s why it has an unusual architecture. The walls are reinforced and compact and a large, heavy door has been placed at the entrance. Above the door there is a hole from which the monks threw boiling water and oil on the heads of the conquerors. The monastery also has a cannon (Toplou in Turkish means “with a cannon”). During the Greek revolution in 1821, revolutionaries gathered there. For this reason the Turks hung 14 monks from the main gate. Today the monastery hosts a small museum with Byzantine icons and wall paintings. The monastery was originally called Panagia Akrotiriani (Virgin Mary of the Cape), after the nearby Sidero cape. Its current name literally means “with the cannonball”, thus called by the Turks for the cannon and cannonballs (Turkish: top) it had in its possession for defensive purposes. Toplou monastery is one of the most significant monasteries in Crete, dedicated to Panagia (Virgin Mary) and St. John the Theologian. It was founded around the mid-15th century, probably on the ruins of an earlier convent. The monastery was plundered by the knights of Malta in 1530 and shattered in 1612 by a strong earthquake. Due to its strategic position, the senate of the Republic of Venice, then ruler of Crete, decided to financially aid in rebuilding it. The monastery flourished until the surrender of eastern Crete to the Turks in 1646, after which it was abandoned for a long time. In 1704, it acquired special protection privileges from the Patriarch (i.e. stauropegic) and was re-inhabited. 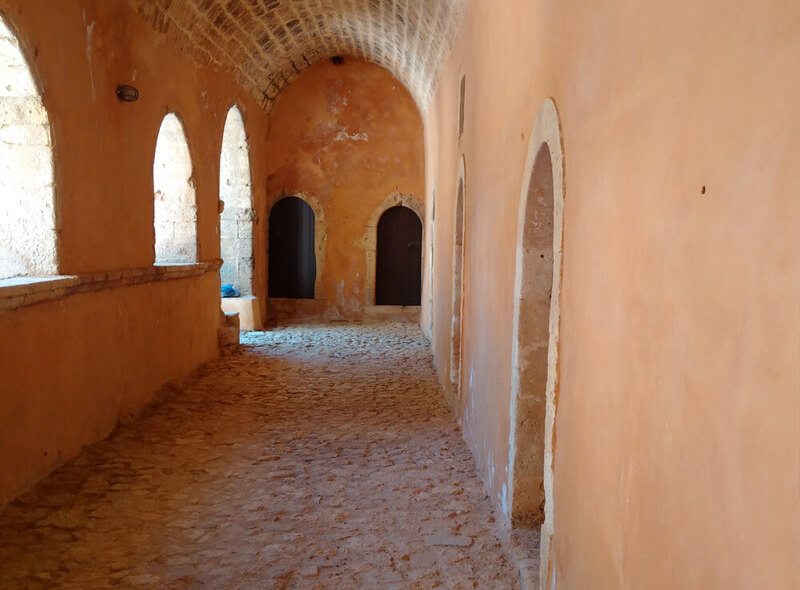 Having to defend itself from pirates and invaders, Toplou monastery is heavily fortified, being laid out around a courtyard paved with sea pebbles and surrounded by strong, 10 m (33 ft) high square walls. In its present form it extends to about 800 square meters in three floors, divided into cells, guest houses, kitchens and warehouses. The main church (ccatholicon) is built as a two-nave basilica and the bellower dates back to 1558. The Monastery was founded between 1580 and 1596 and it is dedicated to the Holy Trinity. The external courtyard features the wine press, the warehouses and the stable, while the monks’ cells, the catholicon and the reservoirs are situated in the internal courtyard. The catholicon is a single-spaced arch-covered church with an ogive arch and a dressed stone belfry which – according to the inscription – dates back to 1618. Apart from the catholicon, there is another, smaller church dedicated to Saint Lazarus, which was built during the era of Venetian rule. During the 17th century, a school of hagiography was in operation here. The Ottomans sacked and torched the Monastery after the revolution of 1821, destroying relics and books from the Venetian era. In 1844, the Monastery was renovated and began operating once more. Kroutstallenia Monastery, dedicated to the Virgin Mary, was already in existence during the 2nd Byzantine era of Crete (961-1204). Its history is closely linked with the history of the plateau of Lassithi and, according to certain sources, it was a center for the concentration of revolutionaries against the Venetians. However, between 1293 and 1543, the Venetians decided to abandon the plateau, so the monastery became deserted as well, before becoming operational again in 1543 when it was renovated by Peloponnesian refugees. The Monastery suffered great destruction and many raids during the revolutions of 1821 and 1866, with its architectural form changing to the point that the present-day buildings have nothing to do with its old form, as most had to be rebuilt. Vidiani Monastery was founded in the mid-19th century by monk Methodius. During the revolution of 1866, the Monastery was set on fire by the Ottomans, but it was soon rebuilt. During the German occupation, its abbot, Dorotheus, was executed by the Germans for his resistance activity. The catholicon of the monastery is a single-spaced church dedicated to the Life-giving Font and features a beautiful wood-carved chancel screen. The name of the Convent is connected to its citadel-type architecture and its location, making it seem like its hanging from the hillside. According to the inscription, it was founded in 1593 by Mitrophanes Agapitos. It was initially a monastery but was converted into a convent in 1993. The single-spaced arch-covered catholicon is dedicated to the Taxiarchs and features a gilded wood-carved chancel screen. Also worthy of note is its Altar Stone, dating back to 1622. Outside the monastery, there is another, more recent church dedicated to the Myrrhbearers. Kera Kardiotissa Convent is dedicated to the Virgin Mary, as are most Cretan monasteries. This is a very old convent that became renowned thanks to the ‘miraculous’ icon of Panagia Kardiotissa, to which reference is made in manuscripts from 1333. The convent is linked to a legend that attracts many worshippers. According to tradition, the icon of Panagia Kardiotissa – for which the convent is named and which is considered miraculous – was stolen three times by the Ottomans and it returned ‘on its own’ all three times. In fact, according to the legend, the third time it was chained to a marble column, which it brought back with it upon its return. The column of the legend is currently situated in the Convent courtyard and the chain has been placed next to the icon. Its initial form was of the citadel type. The catholicon of the monastery was initially a single-space arch-covered church and was expanded with two narthexes and a smaller chapel. The murals date back to the 14th century, while the northern section of the church features 15thcentury murals with characteristics of the Macedonian school of hagiography. The monastery is located on the southern coast of Crete, 41 km south of Sitia, southeast of Agios Nikolaos and 35 km east of Ierapetra. It was built on a high rock in the 15th century. In this monastery lived the monk Gerontoyannis, declared as a saint by the locals for the miracles he performed. The monk is buried in the monastery and the cave in which he was prayed accessible. As it is said, the two small dents in the cave were shaped by his knees, as he knelt and prayed constantly. Finally, the photos and documentation of ecclesiastical art and jewelry attest to the Cretans’ historic creative powers, which due to the primarily religious direction of society found their primary expression through ecclesiastical art. Ioannis Kornaros and the great El Greco are two of the most famous painters mentioned, but numerous other anonymous frescoes also attest to the distinctive style of the ‘Cretan School‘ of painting, marked by its expressiveness and sensitivity. The mixed tradition that grew up following the Venetian conquest of 1204 resulted in a unique combination of Italian and Byzantine influences, which helped create a paradigm for Italian Renaissance painting of the 15th century. Not incidentally, artistic Cretan calligraphy also contributed to the rise of printing in the West, the most famous example being Markos Mousouros, type designer for the legendary Aldus Manutius, 15th century humanist and the first great book printer of Greek and Latin classics. Crete also produced intellectuals, all of which received strong education via the schools and learned monks, most notable being the fiery polemicist and intellectual Georgios Trapenzountios. The author Vitsentzos Kornaros also produced the best-known work of Cretan literature, the Erotokritos. Thus it can justifiably be said, as scholars have long attested, that a veritable renaissance occurred on Crete parallel with the Italian one. For the visitors that wish to explore the spiritual aspect of Crete, we organize religious tours in monasteries of Crete. The inhabitants of Crete have a strong religious belief. The majority of the local population is Christian Orthodox in religion. Over the centuries the fact, that many foreigners occupied the island and tried to suppress the orthodox belief of the local population, only made the belief stronger. That orthodox spirit and belief is reflected on the monasteries of the island. It’s really worth visiting the churches, chapels or monasteries of Crete, to admire not only the architectural style but the wall paintings as well. We can organize for you and your friends or family a tour orientated to the religious places of the island. 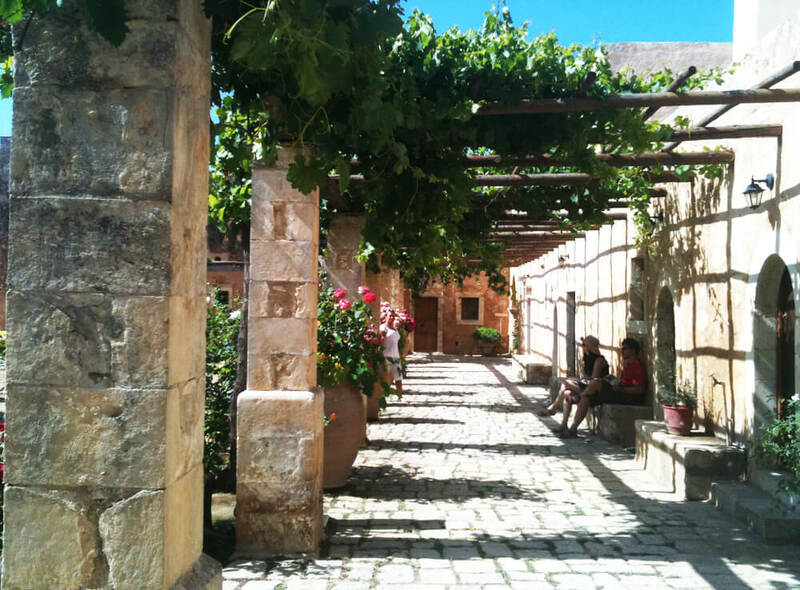 The private tour to monasteries of Crete can be one full day tour or if you wish more days, in order to see as much as possible. All the monasteries of Crete can be combined with full day tours, for example at the Chania tour you can add Tsangarolon Monastery, or at the Lassithi tour you can add Kera Monastery.